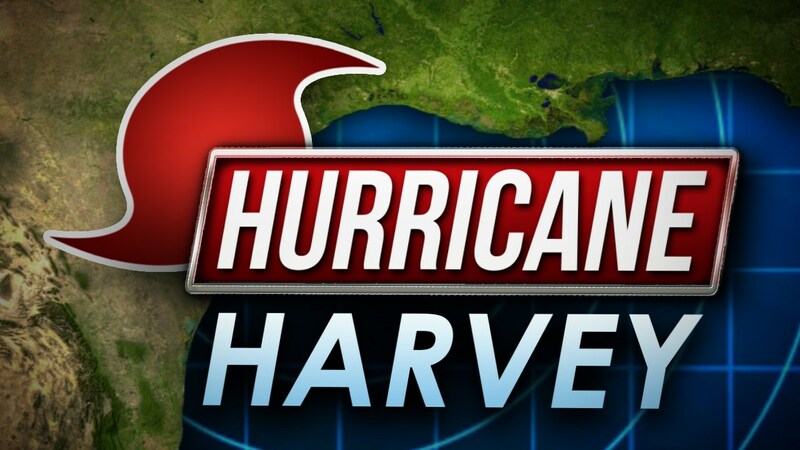 “…The bottom line in this analysis is that both observations of the past decades and models looking forward to the future do not suggest that one can explain the heavy rains of Harvey by global warming, and folks that are suggesting it are poorly informing the public and decision makers. They are using hand-waving arguments to push an agenda, which observations, theory, and modeling show to be incorrect. Global warming is a serious issue and mankind must deal with it, but hype and exaggeration of the current effects is counterproductive in the long term….” (my emphasis on the last sentence). I really like that last line. He’s such a reasonable voice out there in the “Global Warming Wilderness”…enjoy your Thursday evening read! Just remember; listen to scientists, and only the scientists. Wednesday was so refreshing with some morning clouds, afternoon sunshine, low humidity, and no fire smoke. At least west of the Cascades there was no smoke. A different story in Central Oregon…yuck! Check out the view from low earth orbit yesterday afternoon. Bend and Redmond are down in that muck. Today will be similar with another push of morning cloud cover followed by a quicker breakout to sunshine as northerly flow develops. 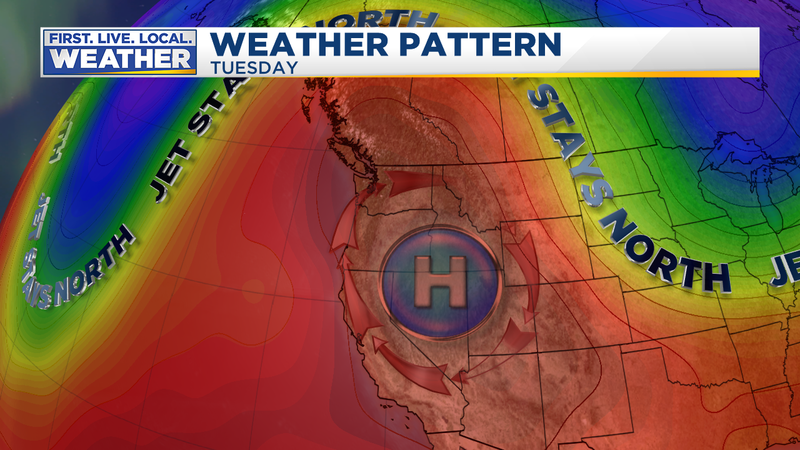 Enjoy the “cool” because the heat is coming back big-time. First, a quick look at Summer 2017 since technically it’s over after tomorrow; September arrives Friday. SUMMER 2017 WILL LIKELY TIE 2009 AS THE 2ND WARMEST ON RECORD. June was warmer than normal, July was close to normal, and of course August has been a scorcher. And what most of you probably noticed…this summer was far sunnier than normal. 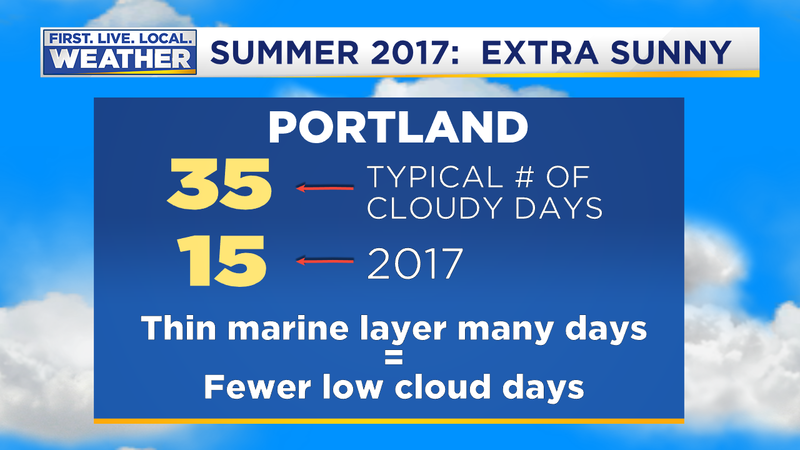 In fact from June through August we saw less than half of our typical number of “cloudy days”. That’s defined as 80% cloud cover or more for any one day. 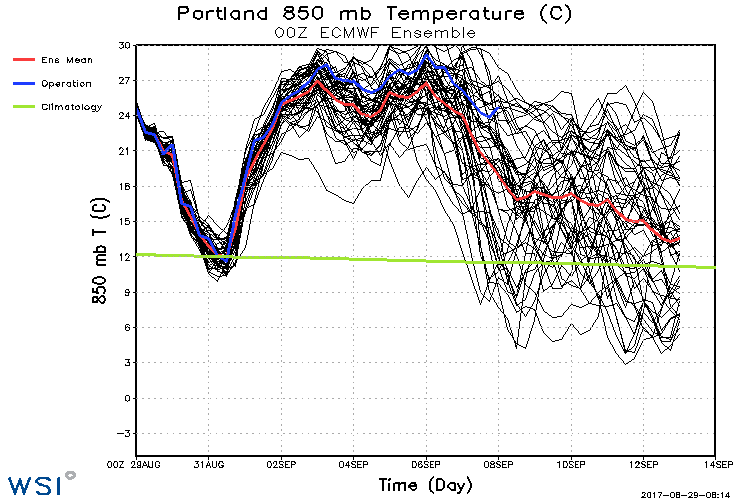 So once again we’ve had a hot summer, this is the 4th consecutive warm/hot summer in the Pacific Northwest. As mentioned in an earlier post, our summers have been warming, and the warming is even more dramatic in some other western USA locations. A quick check of Missoula, Boise, Salt Lake City, Reno and a few other cities show similar summer warming. We’ll see if the trend continues the next few years. 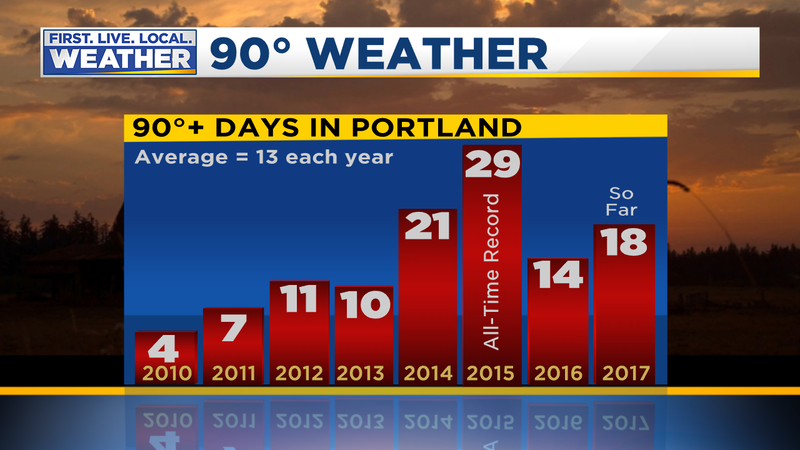 As of this morning, we’ve seen 18 days at/above 90 degrees in Portland; I think there’s a good chance we’ll add 6-8 more before September finishes. Now let’s look ahead, but the view isn’t a good one. I enjoy warm to hot summer weather but this next week looks terrible. Why? I think we are going to have a 5-7 day episode of thick fire smoke combine with hot temperatures. Yuck! 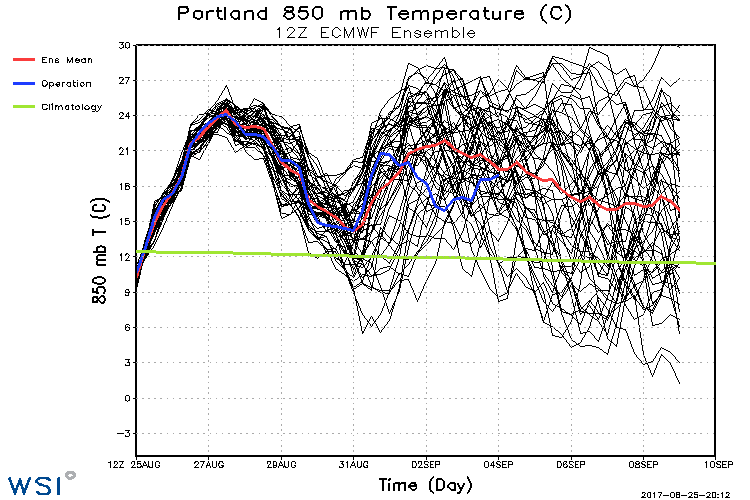 Here’s the issue, models are showing the temperatures Saturday through Tuesday will be equal to that value…somewhere between +26 and +29 C. If we were to get offshore wind flow any of those days, we could go over 100 in September for the first time in almost 30 years. As of now it appears Saturday and Tuesday hold the “best” chance for that to happen. But there’s one big “fly in the ointment” as they say…FIRE SMOKE. For at least 5 days, starting Saturday, the wind flow will be from the south & southeast above the lowest few thousand feet. 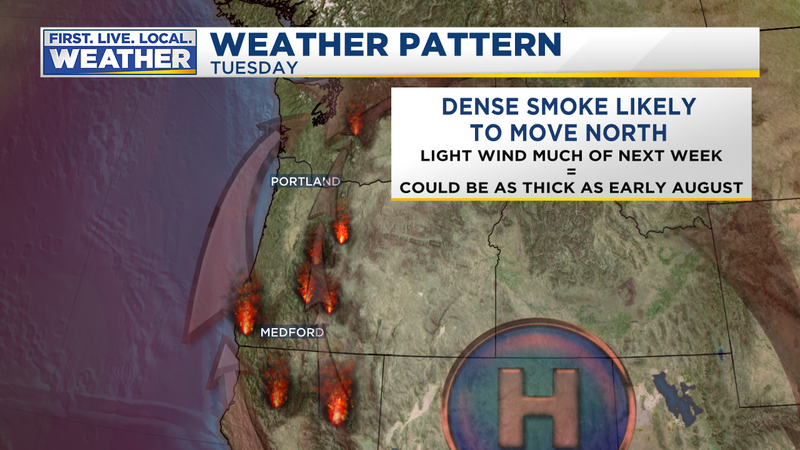 There are many fires putting out huge quantities of smoke to our south and southeast, but there won’t be much low-level wind to get rid of smoke through that period. 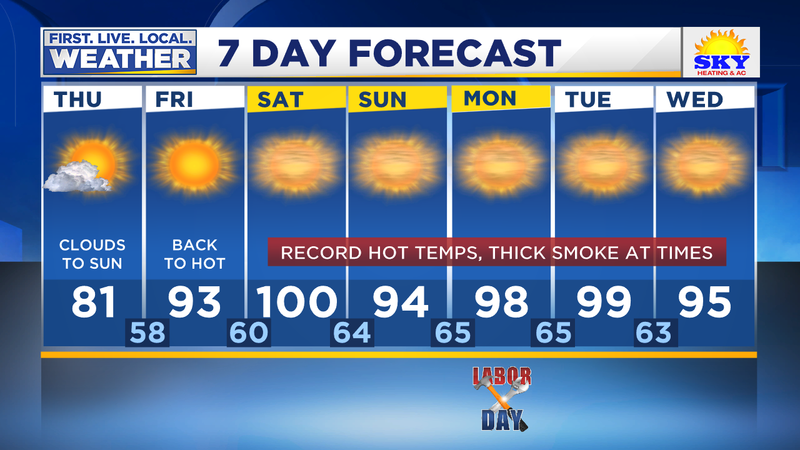 As a result there is an increasing change we’ll have record September hot temperatures under a very dense layer of smoke this weekend and early next week. The smoke could be as thick as what we saw with those Canadian wildfires back in early August. 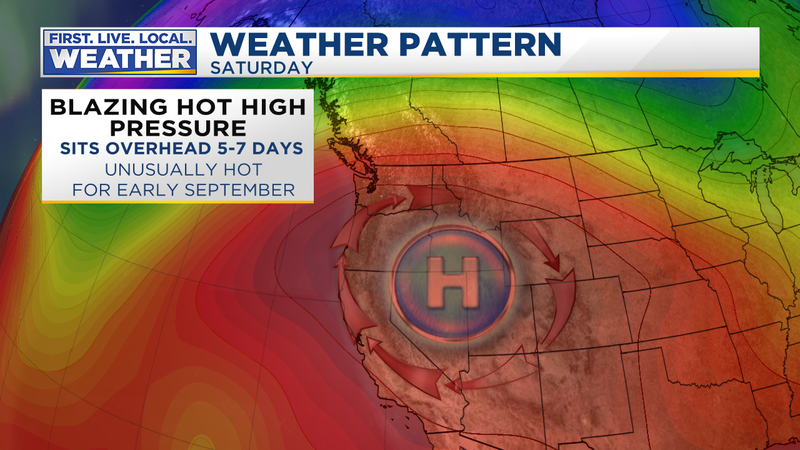 That won’t be any fun, but it could put a big dent in our forecast temperatures; that’s the reason I didn’t go totally nuts with highs up around 105 either Saturday or Tuesday. We may just stay in the 90s if the smoke is real thick. Regardless, if our 7 day forecast is correct, or even 2-3 degrees too warm each day, the first 6 days of this September will be the hottest start to the month we’ve ever experienced! The flip side to this is unusually cool weather to our east. On a Facebook TV meteorologist group there has been some discussion of the unusually chilly middle/eastern USA. One broadcaster in Oklahoma mentioned that this “cool” August is almost unheard of. Interesting. 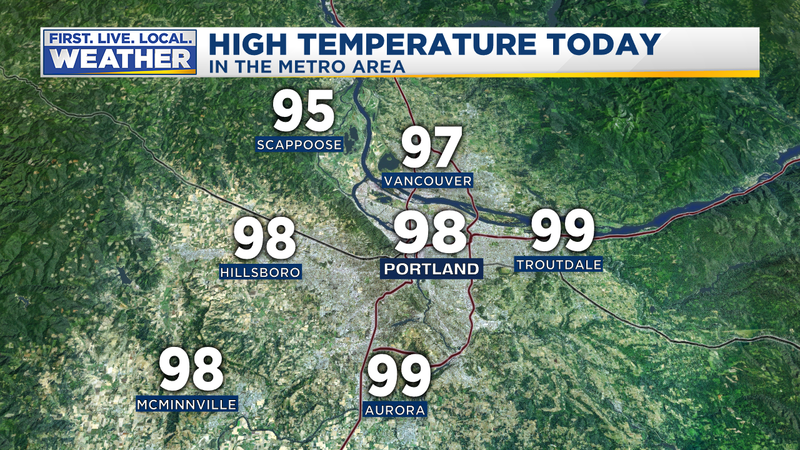 Monday was ridiculously hot; we hit 98 in Portland which is also the 11th day at/above 90 this month. 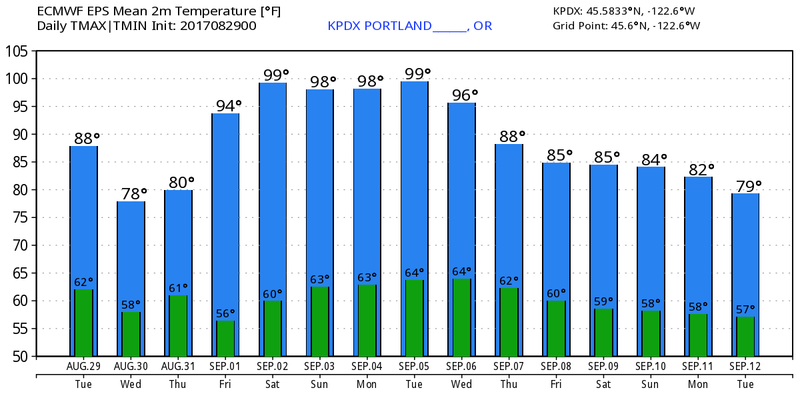 It’s been 30+ years since we’ve seen so many 90 degree days in August…11 so far. 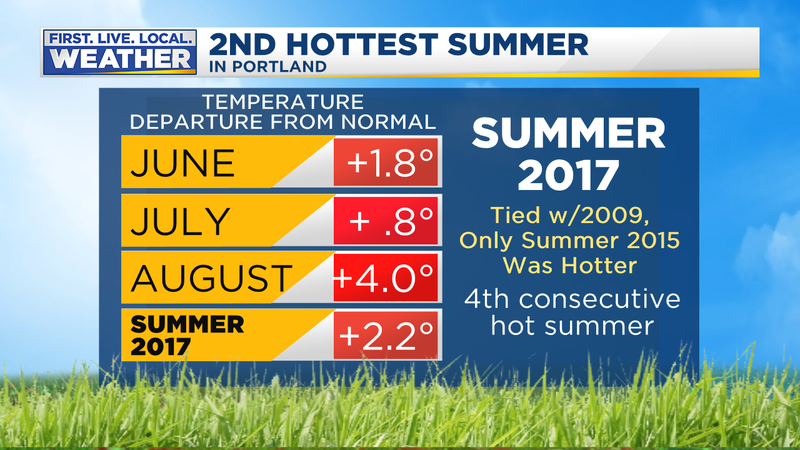 As of now August is also the warmest we’ve experienced here in Portland…beating the record just set in August 2014 (only 3 years ago!). That year the nights were a bit warmer but daytime highs weren’t quite as extreme. Air quality has been going downhill in the Willamette Valley since yesterday evening as more and more fire smoke moves up from the south. 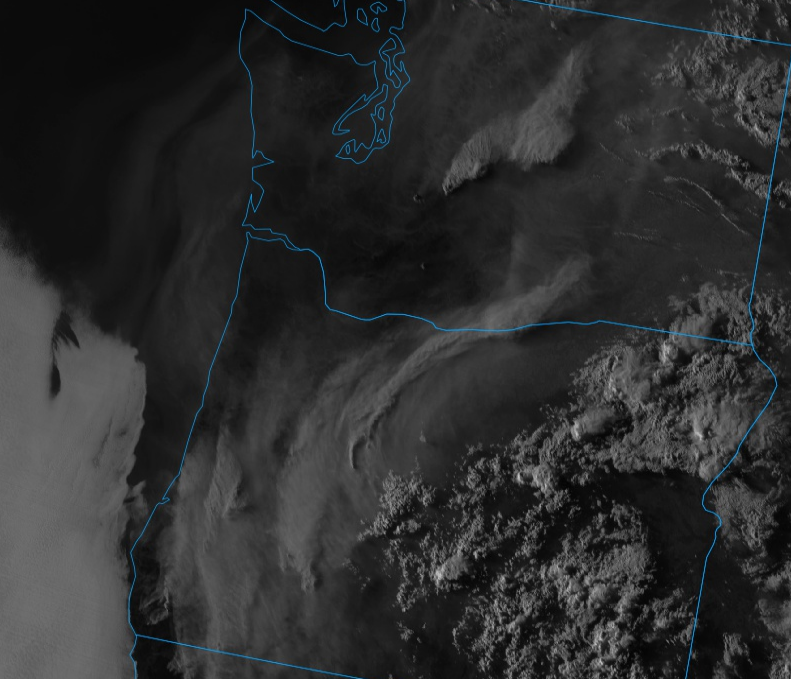 Check out the smoke on GOES-16 visible imagery just before sunset last night. The thickest smoke should gradually get pushed east late in the day. 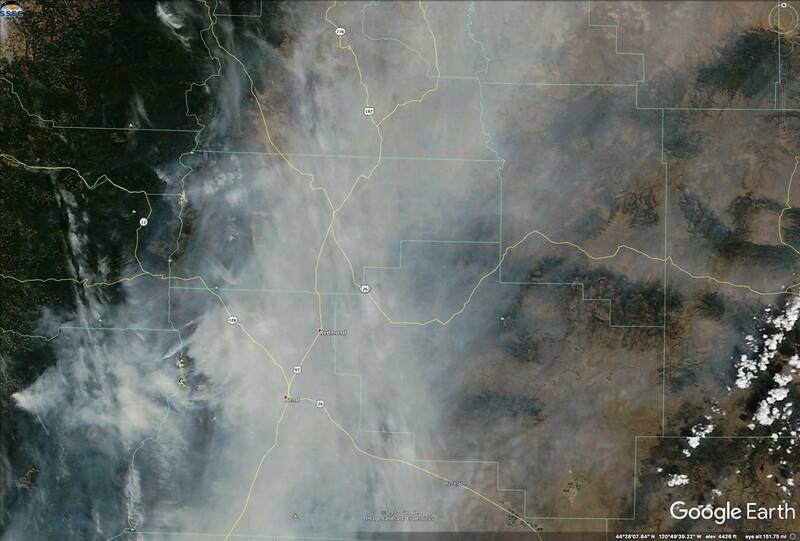 Tonight a strong marine push should clear out all of the smoke west of the Cascades. Wednesday we should see blue sky again…after the morning clouds. Of course we’ll cool down dramatically with the marine push Wednesday and Thursday too. The bad news is we have Heat Wave #4 for this summer coming up Friday through sometime early next week. All models are in agreement building a hot upper-level ridge right over us once again. As early as Friday we’ve got 500 millibar heights up around 590+ over us…the heat will return quickly! 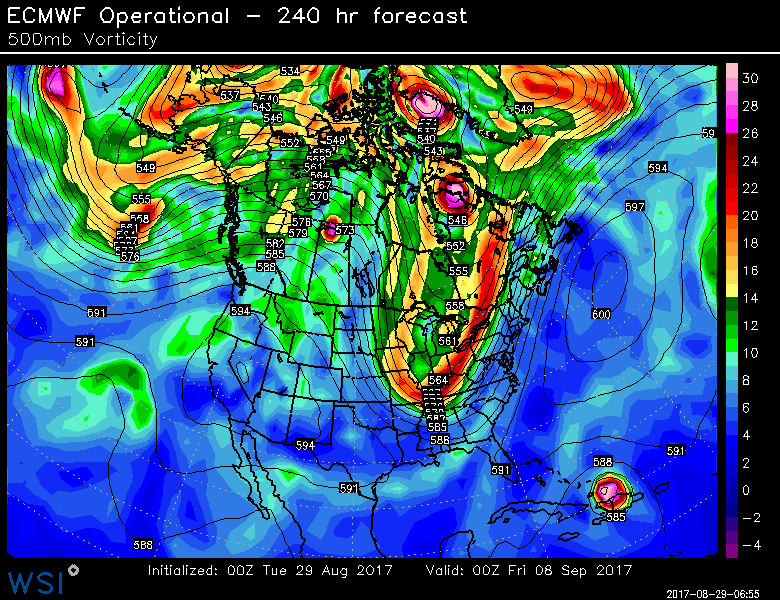 The ridge is firmly established again Saturday afternoon on this chart from the overnight ECMWF model. Hot in the west, unusually chilly in the eastern USA. An early fall for them. This hot ridge with 850 millibar temperatures up around +25 or so means that once again we will flirt with the triple digits, like Monday. Hard to believe we’ll be moving through the first week of September at that time! One benefit of the hot August has been fantastic growth in our gardens…assuming you are watering them well. 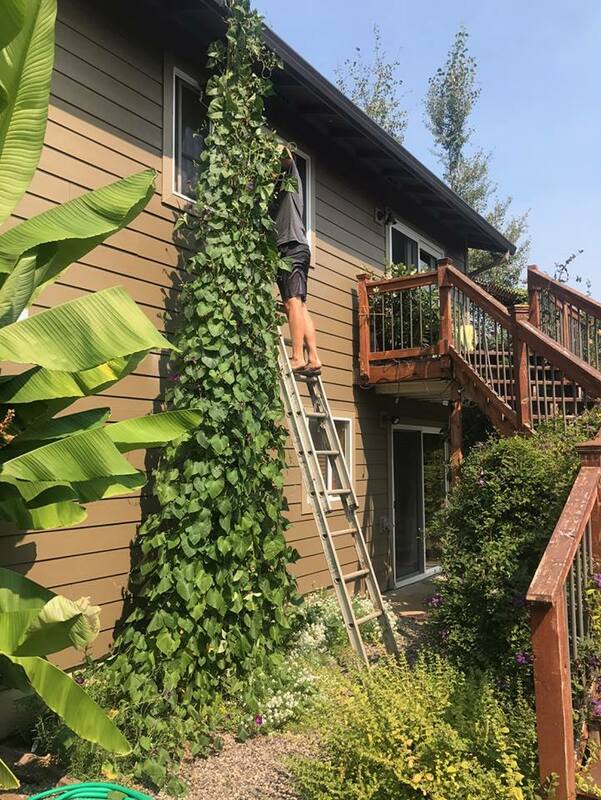 Yesterday I had to pick my two-story high beans with the extension ladder…they were a little too far from the window to get the job done from upstairs. But they sure look neat! There are some morning glory vines wrapped up there as well. Of course August is just about finished with just 6 days to go. It’s been a hot month across most of the Pacific Northwest, but nowhere else in the USA. Note that if you take the country as a whole, it’s a relatively cool month. This is after a slightly warmer than normal July and a warm May + June. That cool spell from December through April is just a memory now…we’re back into the warm regime that hung over the West Coast for about 2 and a half years. With only 6 days left to go in Summer, at least meteorological summer and a pretty solid forecast, we can take a look at the stats. 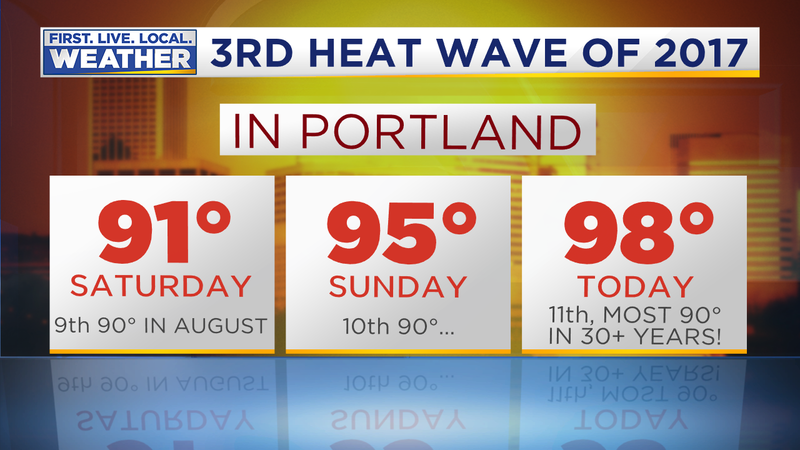 This is likely going to end up as Portland’s 2nd hottest summer on record! Remember many of us (including me) thought that maybe a summer following a weak La Nina winter might be normal or a little cooler than normal. That sure didn’t work out. Are summers getting warmer around here? Most definitely YES! Take a look at PDX average temperatures June-August from the late 1930s through this year, a rise of about 3 degrees in that nearly 80 year period. That’s pretty dramatic. I even heard a radio talk show host yesterday say that we are cooling, or “some scientists think we are cooling” in the Pacific Northwest. Where that comes from I don’t know. Note the last 5 very warm (or hot) summers. Clearly there is some cyclical climate action going on over the years (warming and cooling), but we are warming and most likely it’s directly related to human-caused global warming. No, the sky isn’t falling so far in the Pacific Northwest and it’s not the end of society here. My garden loves this weather and outdoor water activities are thriving. But you should be aware that we ARE warming and assuming that continues even more people will want/need air conditioning in the future west of the Cascades. 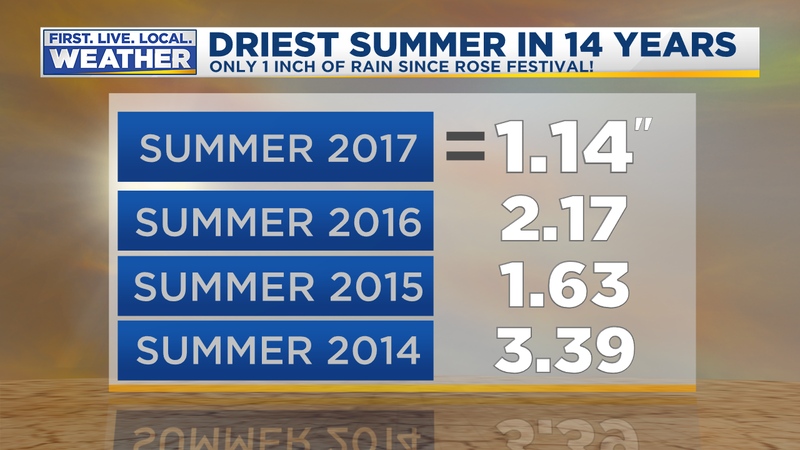 Of course water supply is a much bigger issue, this summer has been even drier than normal, in a place that doesn’t get much rain in summer anyway. If this is the future we’ll need to store more of that winter rain and snowmelt. There will be changes in our local vegetation if the warming continues as well. Look at the difference between Portland and Roseburg as you drive down I-5 as an example. It’s hotter down there in the summertime and drier too. Now before you get hung up on the fact that nights are warming faster in urban areas (they are) than rural areas and that skews the graph a bit, note that even the daytime highs have been rising at a similar rate. Afternoon highs are not affected as much by the heat island effect as overnight lows are. Since there can’t be too many charts in a weather blog…here you have Astoria’s summer temps since records began at the airport in the early 1950s…warming but at maybe half the rate at a station that is not urbanized and right beside the chilly Pacific. Interesting eh? The green line is the average for this time of year…wow, the entire period is well above average. 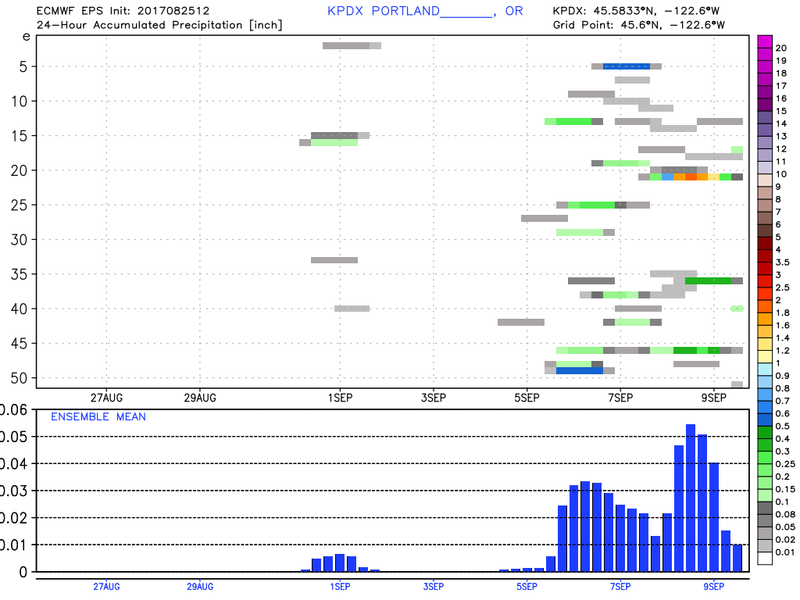 You can see two obvious peaks both in the ensembles and most of the operational run as well. The first is this coming Sunday/Monday, then again right over Labor Day Weekend. These will be the hot periods, with more reasonable, but still warmer than normal temps the 2nd half of next week. This is very bad for our native shrubs/trees which will have gone over 2 months with no substantial rain. They may end up going 3 full months without a soaking. Even in our dry summer climate that’s a bit extreme. 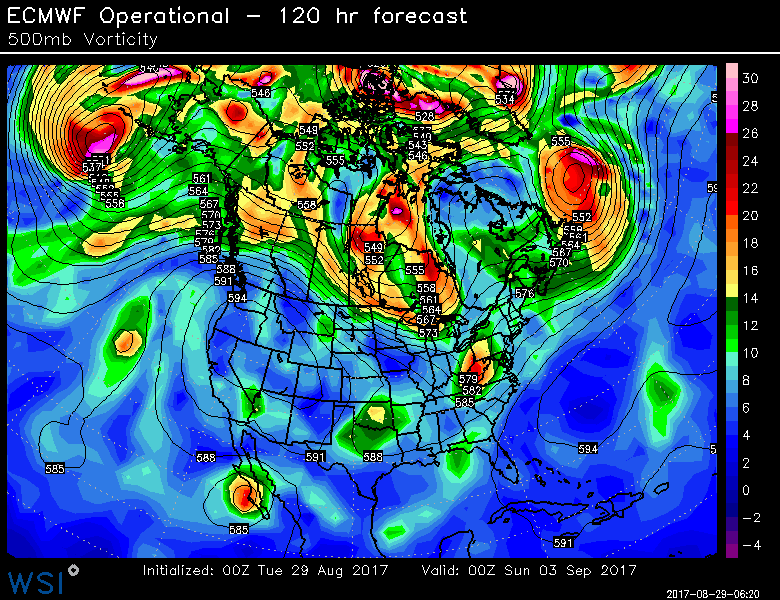 Only 15 of all 51 ECMWF ensembles produce 0.10″ of rain or more into the 2nd week of September. So keep watering all your shrubs and maybe even some trees too. Summer 2017 is definitely not finished yet. 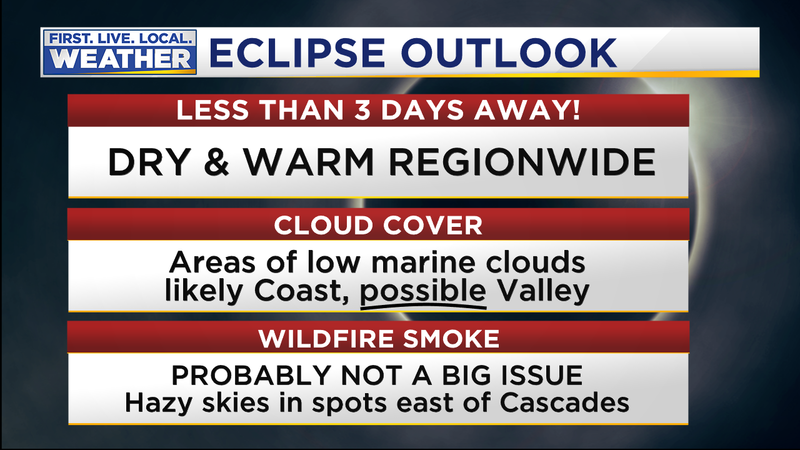 The forecast was right on and as normal as it gets in late August; just about everyone was able to view the eclipse except parts of the immediate coastline where fog/clouds blocked the view. Fire smoke didn’t seem to bother us much in Madras. During the partial phase the decrease of energy from the sun was so noticeable. It’s like we went from strong morning summer sunshine at 9am to weak November sun in just an hour. I think that’s why a lot of people think the temperature dropped dramatically. More on that in a second. I forgot my glasses! I only use glasses in dim lighting (in a dim room or driving at night) since I am a bit near-sighted. So I’m pretty sure I missed out on some details just before/during/after totality. Next time I won’t forget! Nothing all that interesting happens in the partial phase until you get to the last 30 seconds or so before totality. That’s when the light just takes a nosedive. Same for right after totality; within 1 or 2 minutes it was like everything was back to normal. Totality was AWESOME! It’s a cliché, but words can hardly describe it. The partial phase was nothing compared to those 3 minutes. It was white! I didn’t expect that, but that is part of the experience that is so jarring and surreal. The corona is white and the moon of course is black. The lack of a temperature drop surprised me. 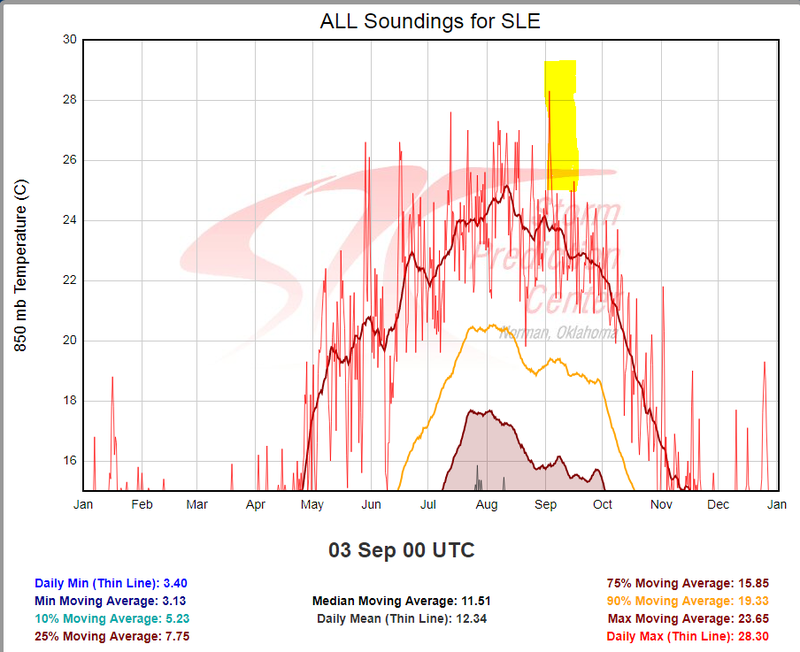 From reading other accounts, some mountain locations saw a good 10 degree or larger drop. Yet I checked Salem/Madras/John Day and they only saw a small drop in temp. I’m guessing it’s due to the time of day. Temperatures are warming dramatically under a hot airmass at 10am on a summer day, so in reality the temperature for many areas just stood still for 90 minutes or so. If the eclipse would have been at 4pm I bet the drop would have been much larger. I noticed people just kept yelling and going nuts in that video through the entire eclipse. At our location at the airport it was initially loud and the crowd settling down as we all sat there in awe…seems like through much of those two minutes of totality it was relatively quiet. I suppose larger crowds would produce more noise and at the airport the thousands of people were spread out over the half-mile long string of buildings & aircraft. TRAFFIC THOUGHTS A note about the terrible traffic forecasts and those who would criticize media or state/local officials. In case you don’t know, there were really no travel issues except ON Monday. Wednesday-Sunday were just fine. But no one REALLY knew exactly how many people were coming to our state so it was all a guess. Luckily we won’t have to worry about it because it won’t happen again in our lifetime. There was (of course) media hype leading into the event, but as mentioned, traffic BEFORE the eclipse was just fine almost everywhere. I think it’s quite possible that a significant percentage of people decided NOT to head into the path of totality based on those apocalyptic traffic stories. But what if there were no stories/warnings and another 200,000 decided to head south? Then someone would have been whining about the state that wasn’t prepared for all the tourists. You can’t have it both ways. The hype was well-deserved though heading home. Just one small example: the two massive lots of campers/cars at SolarPort in Madras (at the airport) did not empty until our 5pm show began. That means some waited almost 7 hours JUST TO MOVE THE HALF MILE OUT TO THE HIGHWAY! Then when I finally left at 7pm, US-26 was still jammed through Madras and moving north to Warm Springs. We ended up going straight north on US-197 to The Dalles instead which was clear by that time. But yes, THERE WAS AT LEAST A 9 HOUR TRAFFIC JAM ON US-26 THROUGH MADRAS. On a somewhat related note…why we still only have one lane each direction from Madras to Government Camp still baffles me in 2017. It’s one of two travel routes from a metro area with 3 million people to Central Oregon. Oregon needs some serious road-building for its burgeoning population. Why is there no freeway between the two locations? It’s not the lightly populated state I grew up in (unfortunately), but we can’t stick our heads in the sand. On a lighter note, I didn’t see it, but heard the traffic line to leave formed quickly DURING TOTALITY…talk about needing to “get out the door” first! How many of you (like me) just HAVE to see it again? The next convenient and obvious choice is the Eastern USA eclipse coming in 7 years. Choose either Mazatlan or somewhere between Texas and Maine in April 2024. I’d stay south…the SW USA often has great early April weather (warm sunshine!) as the Northwest sits in cold showers. Road trip! There is one in both 2019 and 2020 in Chile/Argentina, with the 2nd during their summer (December 2020). That might be the best option weatherwise. Start planning! Can you believe we’re only hours away from the big event? I’m live in Madras this evening on the 10 O’Clock News. Bandwidth is extremely limited over here due to thousands of extra people using their phones so I’ll make it brief. You get the idea. We shouldn’t see a repeat of the high clouds we saw overhead today. Traffic has been just fine across the region too. So stay safe and enjoy the eclipse tomorrow! I’ll be live at the Madras airport from 6am to 1pm. Friday Evening: Traffic Forecast Bust, But Weather Forecast Looks Good! 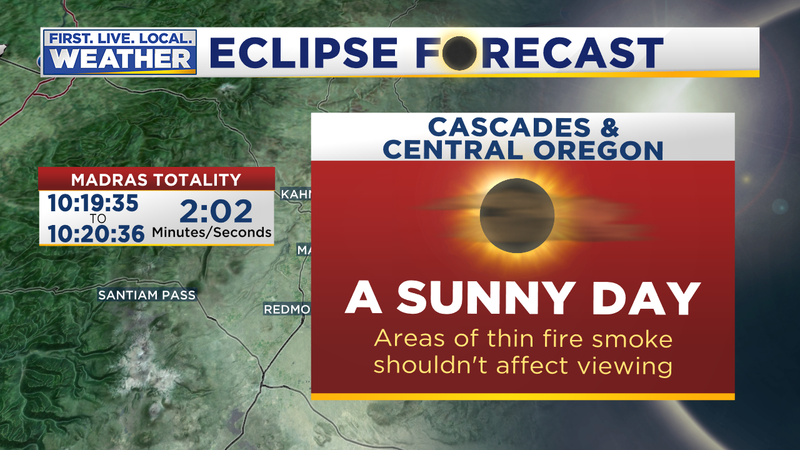 Here we are, sitting on the edge of a big “3 day weekend” that includes the Great American Eclipse. First, the big question everyone seems to be wondering…WHERE IS EVERYBODY? Friday afternoon commutes are typically bad in the Portland metro area in the summertime. My drive in to work was the easiest I’ve seen of any Friday this summer. In fact there were NO TRAFFIC ISSUES IN OUR VIEWING AREA TODAY. So much for the first day of “EclipsePocalypse”. We’ll see how Saturday (when I’m driving to Madras), Sunday, & Monday go. But this will go down as the first TRAFFIC FORECAST BUST of 2017. Hey, if we can have weather forecast busts, the traffic planners and officials can have busts too. But this one helped out everyone. 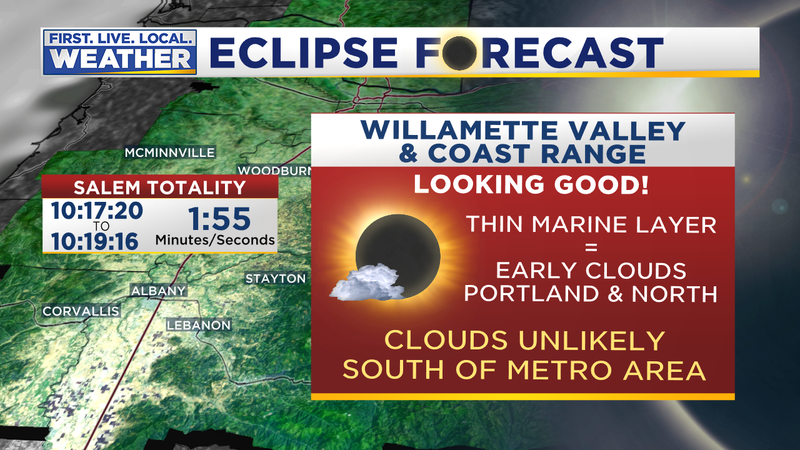 There is a slight chance we get morning cloud cover (mainly before 10am) from the Portland metro area north to Kelso/Longview here in the valleys, we’ll keep a close eye on that. But with strong upper-level ridging we don’t usually see much inland penetration of the low clouds. 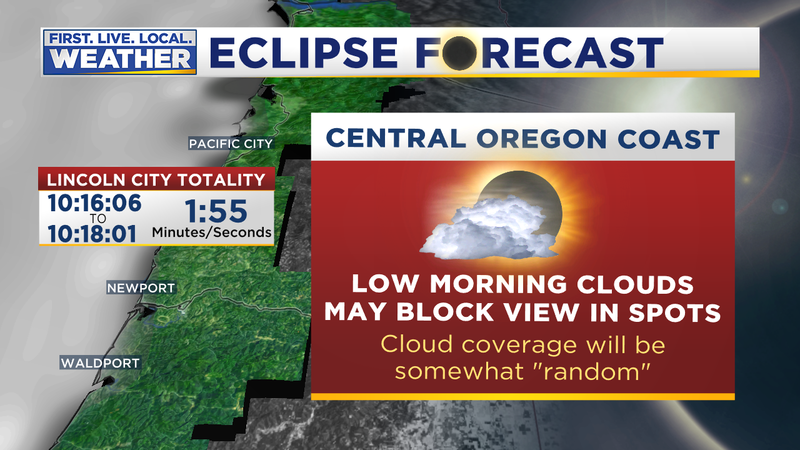 A 2nd minor concern is the possibility of scattered thin high clouds coming in from the northwest during eclipse time. I’m not worried much about this for two reasons: First, thin clouds often don’t impede the viewing much according to eclipse-chasing veterans. And second, only a couple of our models are showing a few thin high clouds moving through anyway. and most fire plumes with the big smoke output tend to form midday and into the afternoons as temperatures rise. In fact the lack of sun will even (briefly) slow down the morning heating, maybe helping keep those fires down. 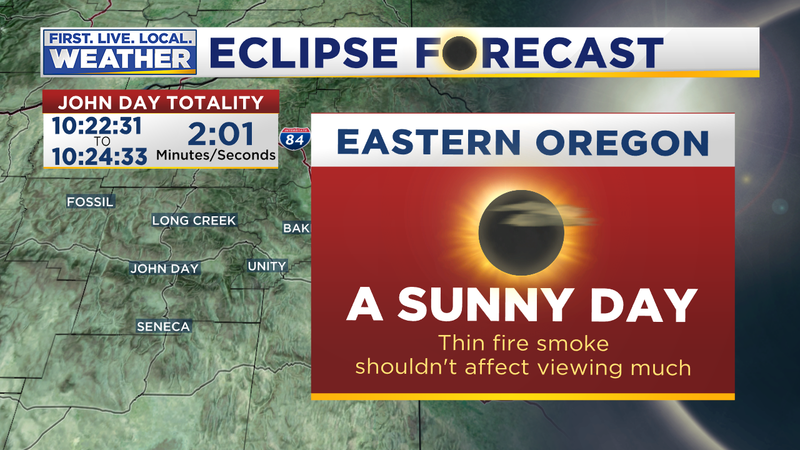 Second, thin fire smoke is no problem according to eclipse viewers I’ve had email conversations with. Let’s summarize a few questions I’ve been asked or heard asked by viewers; some are really interesting. Who needs to wear the eclipse glasses and when? ANYONE outside of totality needs to wear them at ALL TIMES (the entire metro area). Anyone in totality takes them off ONLY during totality. On at all other times. Do I need to protect my pet’s eyeballs? No, they don’t know there is an eclipse coming and have no reason to look up. I can tell you I’ve never seen my chickens stare at the sun, same with the dog. What’s different about the sun Monday? Absolutely nothing, in fact the poor moon is getting the shaft on this one. The SOLAR eclipse is really all about the moon moving in front of the sun. The sun is no stronger or weaker compared to any other day. You can use your eclipse glasses to stare at the sun any day if you want. Why are all these eclipse events being scheduled on a weekday? More people are off work on a weekend. Because…the eclipse can’t be rescheduled. It’s on a Monday. You are currently browsing the FOX 12 Weather Blog blog archives for August, 2017.